BMKG said that people can start enjoying Supermoon since January 1, 2018 night. "The moon will be at its closest distance from Earth in 2018, which is as far as 356,565 km," as written in a BMKG press release received by updetails.com on Monday (1/1). While the next Supermoon phase will begin on January 30, 2018 at 16:56 pm. The distance of the moon and the earth is 2 km away from the previous one. "The moon is on the perigee of 358,993 km." Lucky peak full moon phase of this Supermoon can be seen at night. This Supermoon peak occurred on January 31, 2018 at 20:26 pm. Supermoon incident at the end of January is much awaited because it will be accompanied by a total lunar eclipse. Eclipse is expected to occur from early evening until midnight. Along with this supermoon phenomenon, BMKG warned for residents around the coast. Because, it is feared there is an increase in the maximum tide of sea water. This maximum tide is expected to lead to a rob flood from the sea water pairs that inundate the land. The condition is predicted to occur between 01 - 04 January 2018 and 29 January - 2 February 2018. 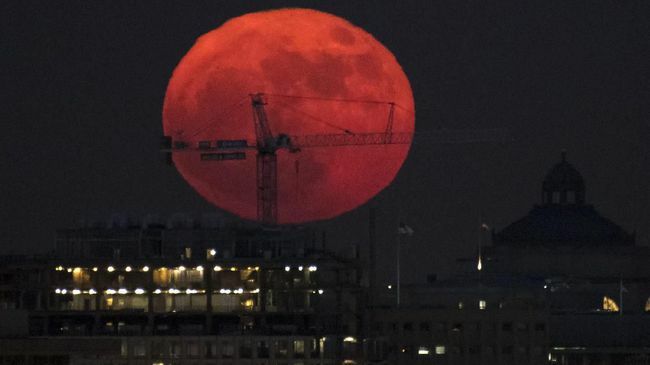 Supermoon phenomenon is a natural astronomical phenomenon. This event occurs at the closest distance of the Moon and Earth. At this Supermoon time, the Moon will be 8lb 14% and lighter about 30% of the current full-moon size. 0 Response to "Enjoyed Two 'Supermoon' in January 2018"